Posted on May 28, 2018 by admin in - WOW! “There have been many American SIGN painters, but there never were any American sign PAINTERS”. This sums up Robert Indiana’s position in the world of contemporary art. He has taken the everyday symbols of roadside America and made them into brilliantly colored geometric pop art. In his work he has been an ironic commentator on the American scene. Both his graphics and his paintings have made cultural statements on life and, during the rebellious 1960’s, pointed political statements as well. Born Robert Clark in New Castle, Indiana, in 1928, he adopted the name of his native state as a pseudonymous surname early in his career. What Indiana calls “sculptural poems”, his work often consists of bold, simple, iconic images, especially numbers and short words like “EAT”, “HUG”, and “LOVE”. Rather than using symbols from the mass media, Indiana makes images of words that focus on identity. Using them in bold block letters in vivid colors, he has enticed his viewers to look at the commonplace from a new perspective. Despite his unique methods, several important aspects of Indiana’s works clearly identify him as a Pop artist. He manages to give a direct and honest description of American culture while appearing cool and uninvolved, much as Warhol did by simply reproducing images of superstars and soup can labels. However, what distinguishes Indiana from his “Pop” colleagues is the depth of his personal engagement with his subject matter. Indiana’s works all speak to the vital forces that have shaped American culture in the late half of the 20th century: personal and national identity, political and social upheaval and stasis, the rise of consumer culture, and the pressures of history. He uses his art it to both celebrate and criticize the national way of life. In 1961, Indiana began a series titled the American Dream, a recurring theme in his work, which along with his other famous stenciled-text images—most notably LOVE—he has used to both celebrate and criticize American life. The American Dream is the cornerstone of Indiana’s mature work. The roots of this powerful concept pervaded the artist’s Depression-era childhood, as well as the social and political aspirations of the United States during his formative years as an artist (1940s-1960s). It was the theme of his first major painting sold to The Museum of Modern Art in 1961. He recalls, “The first two or three dreams (there were 9 American Dream paintings in total), I would say were cynical. I was really being very critical of certain aspects of the American experience. “Dream” was used in an ironic sense. This week’s Work of the Week! WOW! is Robert Indiana’s American Dream #2, a 4 piece set of screenprints each hung in a diamond shape, to form a 1 piece larger diamond shape. Indiana saw the American Dream as “broken. . .no longer in effect for us and for lots of others.” In 1960, Indiana began applying highly saturated color to his geometric paintings. By the end of the year, he was adding words to them. Three of the four panels in American Dream #2 have the words EAT, JACK, and JUKE. Despite how simple Indiana’s verbal-visual amalgams seem, they contain multiple layers of meaning; deciphering them is akin to unraveling a conceptually complex puzzle. By presenting familiar words in new ways, he asks the viewer to reevaluate assumptions and emotions associated with those words. For example, no longer does the word “EAT” simply describe an act, but a whole set of social conditions and practices associated with that act. Viewers might see the intimacy of eating and its central role in family, community, and romantic rituals or they might understand the negative aspects of eating in a society where high-fat and gluttonous diets are the norm. 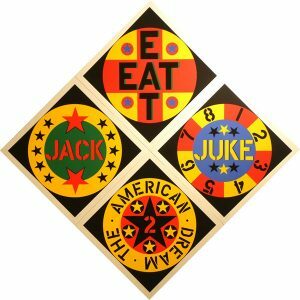 The word EAT also goes back much further and fills a large part of his life, EAT was the last word that Robert Indiana’s mother said before she died. She told him to be sure to eat. As a child during the Depression, Indiana’s father left his mother, and in order to support him, and herself, his mother opened a restaurant, and so for several years things like eat signs also were a prominent part of Indiana’s life. The EAT aspect of this work is also a personal thing. It’s autobiographical. What this work demonstrates, once again, is Indiana’s considerable style as a graphic designer whose manipulation of words, symbols, colors and spaces, can be pleasing and provocative. His designs reverberate, their elements bouncing off one other in dynamic relationships as they comment on the ups and downs of American life, his own included. Robert Indiana provided an example of how to create work that was both deeply personal and universal, work with a clear message that could also be open to interpretation, work that spoke of its own time and reflected on contemporary events, but also carried a message to future generations.